Creative agency Manifold contacted me to design the artwork for a custom arcade cabinet for their 4th anniversary celebration. Back in 2011, Manifold hired me to create a custom piece of art for their San Francisco offices. I made an octopus grappling an engine block and had it printed on a gigantic canvas. 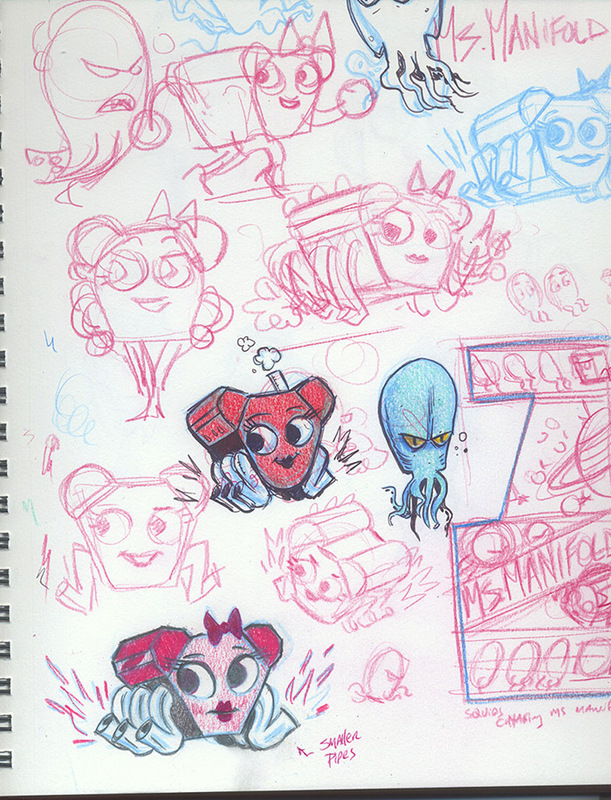 I decided to revisit the theme of engine block and octopus, but this time with a Ms. Pacman/Galaga twist. I love arcade machines and particularly the style of cabinet art from the early 1980s so I wanted to emulate that as best I could. Initial concept sketches for "Ms. Manifold"
Manifold's custom machine would be equipped with a MAME emulator, meaning it would have thousands of games pre-loaded on it ready-to-play. My concept was to invent a fictitious game based on the octopus/engine art that I had created for Manifold the first time around. This time our hero would be a spicy female character like Ms. Pacman but still an engine block. Instead of ghosts, the antagonists are cephalopod-like creatures. But I also wanted the outer space elements of Galaga so I set the background against the Solar System. I also wanted to make some kind of representation of what an actual "Ms. Manifold game might look like on-screen. Like I mentioned, I've always been a big fan of Galaga so I used that as a basis for my pixel-art version of the game. This scene would appear as vinyl background behind the joysticks and buttons on the custom machine. Back in 2006, I did something similar as an art installation for my solo show at Super7 Store in San Francisco featuring a cat/mouse theme. I'm very happy with the way the finished cabinet came out. It's a rare treat to be able to work on a project this high-concept and fun. Apparently it went over well at Manifold's birthday celebration. Lots of visitors stopped to play their favorite games and have snacks. This is also the first time that my artwork has ever been featured on cookies (but cake happened once). 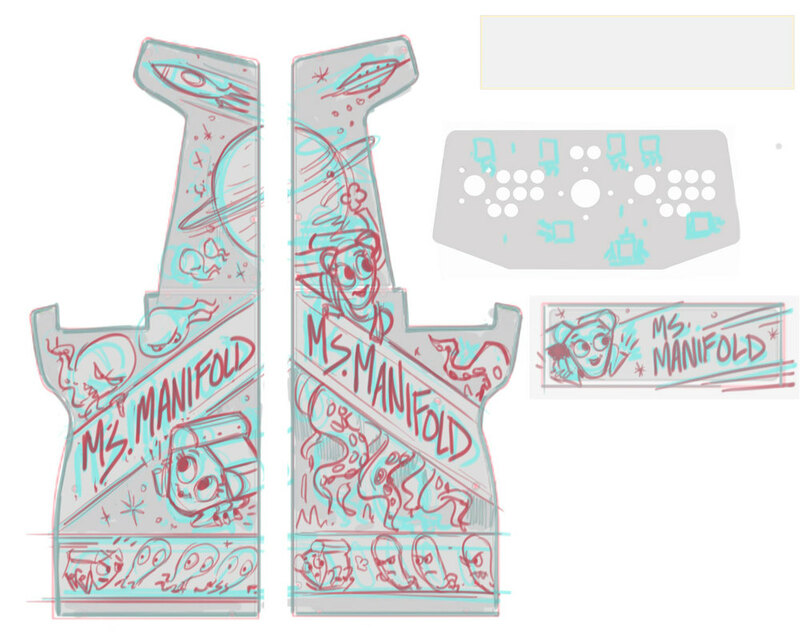 I'm fairly certain that you'll see more collaborations between Manifold and me. Last year we worked together on a campaign for Zazzle's presence at Maker Faire and then again on a website devoted to helping birds take selfies. I feel like we get each other on a basic level and that's the kind of client I want to keep! Cheers to another four years, Manifold.